Do you work for yourself from home? Do you miss community and structure? Coworking is a solution to this problem. In coworking, independent writers, programmers, and creators come together in community a few days a week. Coworking provides the "office of a traditional corporate job, but in a very unique way. Unlike a traditional office, in the Spiral Muse Coworking Group we begin the day with a short meditation and circle to set our personal and work intentions, and check in physically and emotionally with where we are. Then, we work in the amazing Spiral Muse house, sitting at tables or relaxing on couches as we do our work. Even though each of us is doing separate work, perhaps programming or writing a novel, we can feel each others presence, run ideas by the community, or take breaks together at the "watercooler." We take lunch as a group, and then later in the day have a 45 minute break where we do a different healthy activity every day, such as guided yoga, meditation, a nice walk, or perhaps a bike ride in the sun. We end the day at 5:45 PM sharp, supporting each other in both starting a good work day at 9 AM and ending our work in a healthy, balanced way at the end of the day. Spiral Muse will be hosting a coworking group beginning August 8th. We will meet for two days a week, Monday and Tuesday, from 9 AM to 5:45 PM. Every Tuesday from 4:45 PM to 5:45 PM we host a free open house; drop by, have some tea, and check out the space and learn more about coworking. You can also drop by the coworking space for a full day for only ten dollars suggested donation. After three days of trying out the space we ask that you then decide whether to join the group or not. The price per month for both the space, activities, and wireless is only $100 dollars. Coworking is the most ideal for those who work from laptops, such as computer programmers and writers. Space is limited to 8 people and is filling up, so reserve your space now in the coworking group. Please contact Brad Neuberg at bkn3@columbia.edu or call him at 510-938-3263. 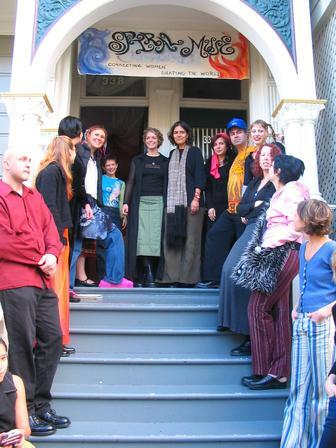 The Spiral Muse house is located at 3387 and 3389 22nd Street between Guerrero and Valencia. The Spiral Muse website is at http://www.spiralmuse.org/. Feel free to drop by on Mondays and Tuesdays, between 9 AM and 5:45 PM! I would like to find a "coworking community" close to me, in/around Cambridge/Somerville in MA. Do you know of any coworking resources? Thanks!